At the end of WWII the Russians took over the Walther Factory in Zella- Mehlis and confiscated all the machinery. Despite this, Fritz Walther decided to stay in Germany and moved to Heidenheim, then later to Niederstotzingen, where he manufactured calculating machines. Due to legal restrictions by the High Commission for Occupied Germany (HICOG), Fritz Walther was not allowed to produce firearms. But guns were closest to Walther’s heart and there were no restrictions on airguns, so he soon began production of air rifles. He founded a new factory in Ulm, and in December 1950 the first Walther airguns left the factory and were very successful. Restrictions were eased, Walther prospered and only a few years later the production of .22 rifles and hunting rifles began. 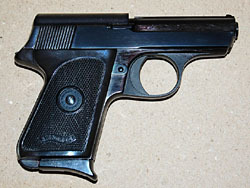 In 1953 the first parts for postwar PP and PPK pistols left the factory. The deployment of the German Military (Bundeswehr) led to a great demand for service pistols. So Walther reissued the P38 pistol which was adopted as the new service pistol P1 for the Bundeswehr. Production started in April 1954 and only several months later more than 10,000 P1 pistols had left the factory. But not only the military market prospered, so Walther started thinking about the production of a new vest pocket pistol for the civilian market. 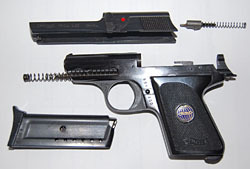 On the principle “if it isn’t broke don’t fix it,” the design of the Model TP (Taschenpistole or pocket pistol) is more or less the same as the very successful Modell 9. The TP was introduced in 1961 as the first Walther vest pocket pistol of the post WWII era and was produced in a .25 ACP and a .22 lr version. The gun looks somewhat like an over-sized Modell 9 with the same straight clean lines, but a little more streamlined. One of the most obvious changes is that the saftey lever is moved to the left side of the slide. The 90-degree-turn lever directly blocks the striker. Down is the fire position and up is the safe position. The slide features 14 fine triangular-cut slide serrations on both sides. It has two arms that extend forward from the breech block on either side and meet in a cross bar with a hole drilled into it just under the barrel. The cross bar serves to compress the recoil spring and the guide rod protrudes from the hole during recoil. The guide rod itself is encased by a thinner and shorter spring and located within the recoil spring. The extractor is an L- shaped piece of steel positioned in a drilled space on the right side of the frame, so that it sits beside the striker. The ejector is positioned on the left side of the breech block behind the magazine well. Identical to the Modell 9, the slide is held on the frame by a dumbbell- shaped bolt at the rear, the upper portion of which additionally serves as a backstop for the striker spring. The bolt has a hole drilled in its upper portion through which the rearmost projection of the two-piece firing pin protrudes to indicate when the gun is cocked. The connector runs externally on the right side of the frame, beneath the right grip plate. Both versions of the TP have magazines for six cartridges. The magazines of the models differ somewhat. The .25 ACP magazines have six holes drilled in the flanks, whereas the .22 versions have only a single hole in the right side. Additionally, the follower for the .22 has a round knob which can be depressed to make loading cartridges easier. Both types have a black finger rest to support the ring finger and pinky. 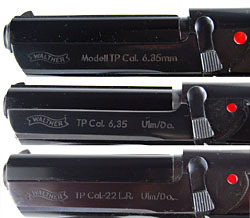 Magazines show the Walther-banner at the bottom of the right side and the caliber stamped on the left. The .25 ACP magazine shows “6,35 mm” and the .22 lr. shows “.22 lg.” (“lg.”is a german appreviation for “lang”, which means long). The two-piece black plastic grips have the Walther-banner at the bottom. 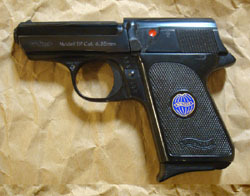 The left grip has a circular enamel gold-blue medallion with the Walther banner inside a globe, hinting at the global activities of the Walther company. The right grip has a simple black ornament medallion with 16 tiny holes arranged in a circle. The TP continued in production until 1971 with a total of approximately 11,250 pieces in 6,35 mm (highest serial number I know is 11520) and 3,417 pieces in .22 long rifle. Serial numbers have 6 digits. Whereas the .25 ACP versions start counting up from 001000 to approx. 012250, the .22 versions start at 200011 (up to 203427). There are two minor variants of the .25 ACP models known. The early model has the Walther-banner on the left side of the slide and the inscription in sans-serif characters “Modell TP Cal. 6,35mm”. The right side of the slide is inscribed “Carl Walther Waffenfabrik Ulm/Do.” The red dot indicating the safety is off is approximately 4.5mm in diameter and the front sight is approximately 1.4mm wide. The highest number we have recorded for a first variant in .25 ACP is 001944. Make sure the chamber is empty, then pull the trigger to uncock the striker. Press in slightly on the dumbbell-shaped bolt at the rear of the gun, and use the toe of the magazine, your fingernail, or a small instrument to lift the latch up. The bolt should slide back under spring tension, but you might have to pull it back manually. Lift the rear of the slide up and ease it off the front of the frame. The recoil spring can then be removed from its recess beneath the barrel.